This year, Cisco Live is calling all IT superheroes to come to Las Vegas for a five day geek-fest of education and inspiration. The program is jam-packed with more than 1,000 sessions. You’ll have access to the best and brightest minds in the industry, and there will be more than 300 partners showcasing their wares. It’s all happening from June 25-29 at Mandalay Bay in Las Vegas. Citrix will be there in a big way — be sure to pay us a visit in the World of Solutions at booth #2329, where we’ll be showcasing our products and presenting our solutions. And? 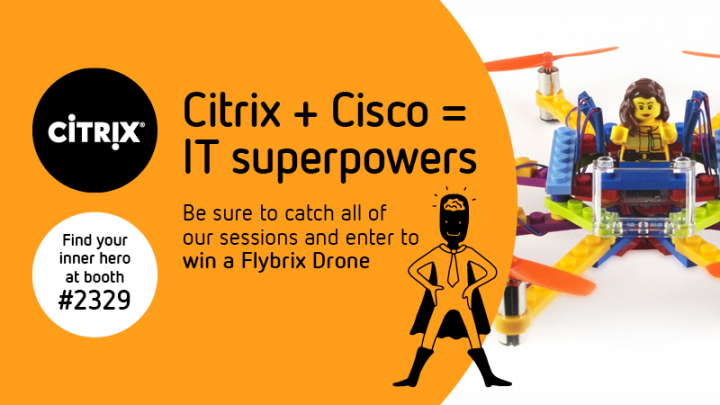 You can get your Citris Superhero mini-figurines and enter to win a Flybrix Drone! Engage with Citrix experts and channel the inner IT Superhero in YOU. You can meet the trusted innovators from Citrix, discuss your projects, and figure out how to make IT the strategic enabler for business transformation. Sign up here: Meet my Citrix Expert. See a demonstration of configuring networking services using Service Graph Templates on Cisco APIC and automation with Stylebooks on using NetScaler Management and Analytics System. See a demo of Windows Azure Pack admin portal setup, user portal setup, and load balancer configuration and a demo of NetScaler fully managed by Cisco APIC using a device package. See a policy enforcement proof of concept where Tetration controls load balancing to a server using NITRO API calls to NetScaler. Ish Limkakeng, VP Product Marketing, Cisco advocates for our partnership in data center analytics with Citrix NetScaler MAS and Cisco Tetration.